Below is the detailed biography of Christina Rossetti, an English poet in the Victorian era. Her type of writing was devotional, for children and also romantic poems. Many of her poems have been turned into musicals by Harold Darke, an English music composer. 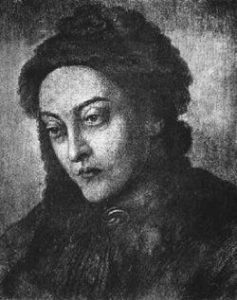 Christina Rossetti was the last of the talented children of the Rossetti family. She was born on the 5th of December 1830 in London to Gabriele and Frances Polidori Rossetti. Her father Gabriele was a celebrated poet and political writer. 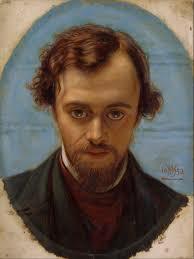 She had two brothers, one of whom was the great artist and poet Dante Gabriele Rossetti and William Rossetti. She also had a sister called Maria Rossetti who also became a writer. She was educated at home by her parents and had access to the extensive library in her house. She grew up reading religious, poetic books and novels which enhanced her imaginative power and led her to be a storyteller herself. She lived in a house full of artists that were frequently visited by influential Italian people such as artists, revolutionaries, writers, and scholars. She often read works of Dante Alighieri and Petrarch and other people of her Italian origin. This study has influenced her style of writing in a major standard. While Christina was growing up, her father’s health was deteriorating in a severe manner. The man suffered from acute physical and mental illnesses which were later diagnosed to be tuberculosis. This led to him slowly losing his eyesight. He gave up his prestigious job at the King’s College where he was a professor. He lived in this distress for nearly 11 years. To support the family, Vasto Rossetti, the mother of Christina went to work along with her elder sister Maria who worked as a governess in a household. William was also working for Excise Office and Dante was studying art at the school. This led to her isolation and led to her depression. She would suffer a high amount of anxiety and mental breakdowns from time to time. All this at the tender age of 14. During this time, she sought comfort in the Bible and was also deeply involved in the Anglo-Catholic movement in the Church of England. Christina wrote down her poems while she was 12 years old. She developed her writing skills and experimented with her styles for a period of 6 years. 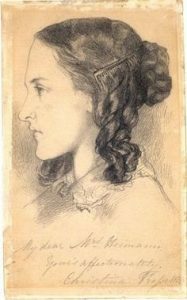 She then published her first work – “Death’s Chill Between” and “Heart’s Chill Between” at the Athenaeum when she was only 18 years old. They were published under the pen name Ellen Alleyne. She also started writing for the magazine ‘The Germ’ which was a preraphaelite magazine, owned and published by them. She published her ‘Goblin Markets’ in 1862 which brought her a huge amount of fame and success. She was then known to be the first female poet whose work was as influential as it was. ‘The Prince’s Progress and Other Poems’ was another famous work of Rossetti in London, in the year 1866. She also wrote children’s books, one of which was ‘Sing-Song: A Nursery Rhyme Book’ which was published in 1872. She also wrote ‘A Pageant and Other Poems’ which was published by Alexander Macmillan in 1881. Her non-fiction, religious collections included ‘The Face of the Deep’, a book of devotional prose comprising of prayers which appeared in 1893. ‘Seek and Find’ by Christian Rossetti came in 1879 and was based on short stories of the bible. Christina has been painted on quite many occasions by her brother Dante Rossetti. She also modelled as Virgin Mary in his painting of the Holy family. Below are some of her portraits. 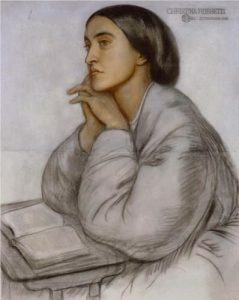 A portrait of Christina Rossetti by Dante Rossetti in watercolour. 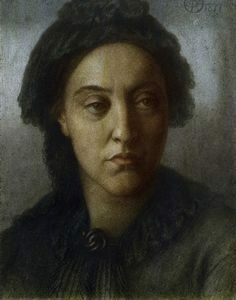 Christina Rossetti remained a Catholic spinster of the Victorian Era all her life. However, she was involved with some of her friends such as the painter James Collinson who was also a member of the PRB. They were even engaged but the engagement broke off because of religious reasons where Collinson had opposite views towards Catholicism. She is also known to be seeing Charles Cayley but due to same religious reasons, they did not work out either. Charles was an English linguist. She was a stay at home girl and had her own circle of friends. Christina was introverted in nature. For quite a while she suffered acute depression which is why it is believed that she chose to live alone. Her life also consists of social work. She has volunteered at the St Mary Magdalene Charity house where she served former prostitutes. She was very much against women suffrage and therefore, her poems express a tinge of feminist factor. She was against underage prostitution, exploitation of women and animal cruelty. In her early 60’s, Christina suffered from an enlarged thyroid which is commonly known as Graves disease. Later, she developed breast cancer and even though the tumour was removed, it re attacked in the next year 1894. She died on the 29th of December 1894 in Bloomsbury in the West end of London. She was buried at the Highgate Cemetery in North of London.